The main Red Trail makes its way through the rocky landscape; it comes to a large rock formation, just after passing by a connection with the Lumber Road of the Yellow Trail. The Chief imagined cattle rustlers of the Badlands camping under the cliff and dubbed the landmark "Rustlers' Hideout" (Williams and Tracy). Just beyond the Hideout is another trail fork. To the right (northwest) is a short connector leading to Cooning Orchard and the Yellow Trail while the Red Trail follows the left (southeastern) branch. Hikers will notice that the pathway has both red and yellow markers over part of the remaining distance. The red markers signify Camp Yawgoog's Red Trail while the yellow ones are for the AMC's Narragansett Trail; do not confuse the AMC trail with the Reservation's Yellow Trail -- both of which are on Reservation grounds. After a few minutes the trail descends into a forest of cedar and rhododendron called Cedar Swamp. 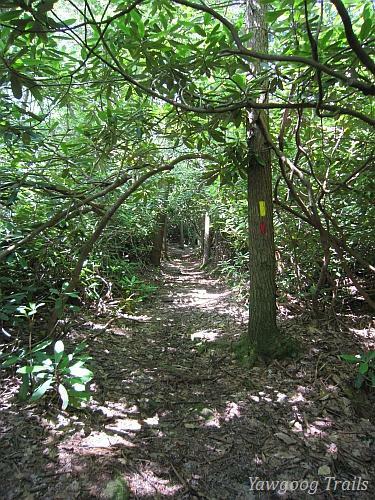 Rhododendrons grow so vigorously there that this part of the trail looks like a tunnel, providing a cool reprieve from the summer heat. The small stream that drains this swamp follows the valley into Wincheck Pond. Starting from the intersection, the main Red Trail continues in a western direction and reaches High Rock on the left (south); High Rock got its name in 1990 when staffers, looking for the then lost Symbol Rock Trail, climbed up the slope on the right (north) to reach the boulder. 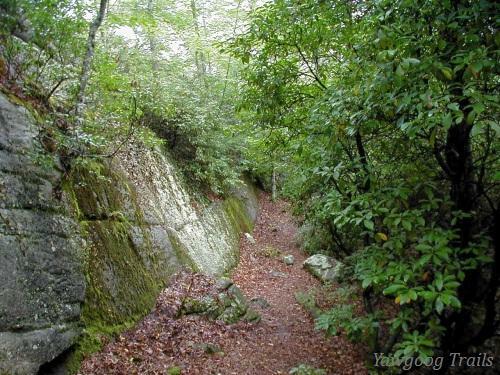 The Red Trail meets the Symbol Rock Trail, a side-trail associated with the Green Trail, which enters from the right (northwest). The Red Trail continues toward the southwest and passes by a suspicious pile of stones to the left (southeast), just a few feet west of the intersection with the Symbol Rock Trail. 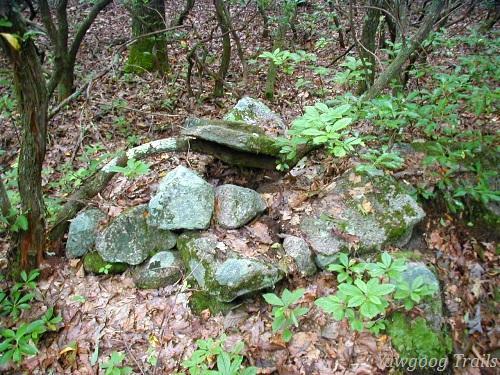 This pile is believed to be the "lost" charcoal "kiln" mentioned in the 1976 version of The Story of the Yawgoog Trails . He wrote that he thought it was located somewhere between the Richmond Boulder Field and the Southwest Marker (Williams and Tracy); however, the maps of 1931 and 1941 place the fireplace nearer to High Rock. The path soon passes through a vast semicircular patch of glacial boulders. This area, previously known as Rip Van Winkle's Glen, is called the Richmond Boulder Field. It is named after Gerald M. Richmond, Yawgoog staffer, Eagle Scout and Scoutmaster of Troop 38 Providence. A distinguished member of the United States Geological Survey, Richmond wrote The Geologic Story of Yawgoog Scout Reservation in 1947; it was based upon a survey of the property made by the Waterman Engineering Company in 1930. 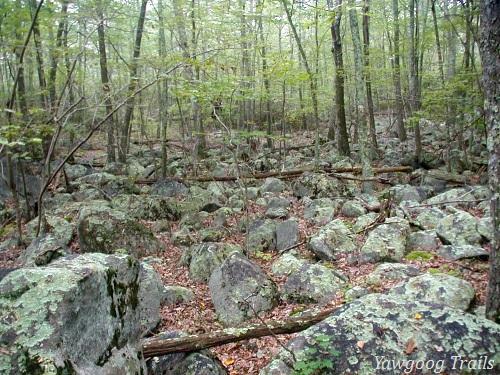 Richmond's pamphlet, updated in 1975, describes the geological history of Yawgoog and its sites of geologic interest. 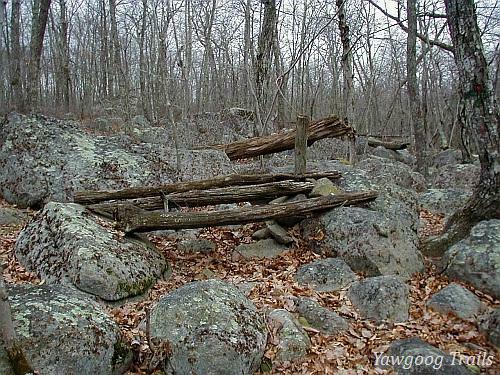 In the Boulder Field, the trail ends at the Southwest Marker of Camp Yawgoog's property on the Rhode Island/Connecticut border. 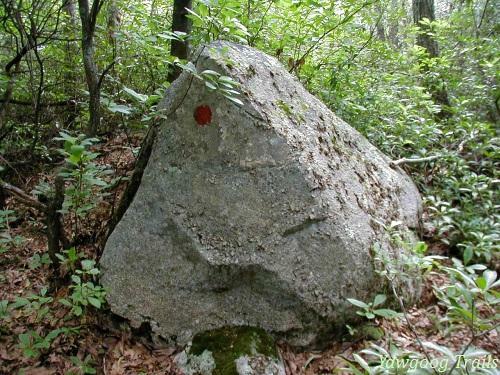 The marker is a pile of stones and a log stump on a boulder where the path makes a sharp turn to the right (north). The right-hand path is the Green Trail, which ends here after leaving the Sawdust Pile.